Hymns #34 -- "O Ye Mountain High"
"And the Oscar goes to...HYMN # 34 "O YE MOUNTAIN HIGH!" Charles Penrose sang his new hymn text to an old Scottish ditty, "O Minnie, O Minnie, Come o'er the Lea." The tune happened to be incorporated in the 1939 Oscar-winning musical score "Stagecoach." "A Latter-day Saint who lives in Hong Kong or Nebraska or Haiti probably will not think of the snow-capped mountains of Utah as "my own mountain home." But in fact, this hymn was written by a man who had seen Utah only in his imagination. And every member of the Church can respond to this hymn in its figurative meaning: the restored gospel grants to its followers a life of freedom, purity, and worship, far above the cares and errors of the world." (Our Latter-Day Hymns, pg. 63). The kids kept asking, "are you allergic to something?" "Yes," I'd reply. "I'm allergic to Utah." Well anyway, the thing that gets to me in the text of this hymn is the old idea that Zion is in the Salt Lake City area. The chorus of this hymn, "O Zion! dear Zion!" really doesn't tell the whole truth. Having lived outside of Utah most of my life and having spent a significant amount of time living in South America (mission) and Europe (Fulbright), I've found that Zion is really wherever members of the Church come together. So, for this reason alone, I think Hymn #34 has had its time in our hymnal but should be retired. Before we send it away, can we learn anything from the music that will help us as we write our own hymns or primary songs? The tune is full of nice folk elements. There's a lilt which originally was due to the theme of young love. But that translates well to frolicking in the mountains. The dotted eighth and sixteenth figures which almost always have the same repeated melody notes give it that skipping feel. The little ending melodic turn at the end of the verse, right before the 2/4 bar, gives the tune yet another folky feel. This is repeated again at the end of the hymn, though changed slightly, and with a fermata for added emphasis. There's a big parallel octave in the 4th bar, but as it's between the end of the first big phrase and the start of the second big phrase, and it's after a long-held note, it doesn't bother me. Other than these few things, there's not that much to glean. There are lots of 1 chords, 4 chords, and 5 chords, as expected in a folk song. Plenty of passing tones. I'm much more interested in tomorrow's hymn. Talk to you then! P.S. Need some help with your hymn or primary song? Not sure if it's finished? Let me see if I can help. Apply for a hymn critique by clicking on the big button below. P.P.S. If you'd like to download my complete harmonic anlysis of this hymn, click below. 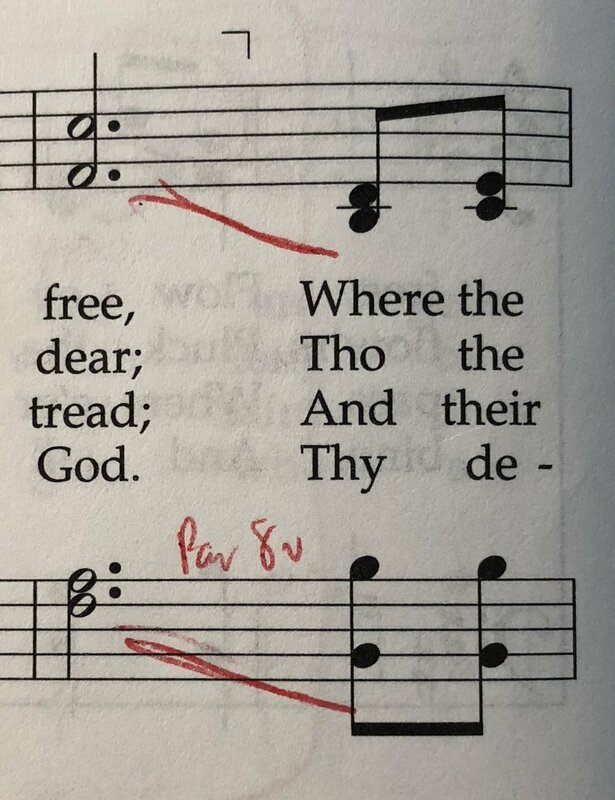 Another Utah-centric hymn that probably won’t make the new hymnal, but I do think referencing what Karen Davidson has to say about this text is worth noting: “this hymn was written by a man who had seen Utah only in his imagination. And every member of the church can respond to this hymn in its figurative meaning: the restored gospel grants to its followers a life of freedom, purity, and worship, far above the cares and errors of the world.” A very nice sentiment and good advice in making these messages applicable to us, but I still think that these nice Utah-themed hymns will most likely be omitted from future hymnals. Nothing about this hymn really excites me musically. It is much more song-like in nature than a majestic hymn. It seems to lilt as if it were an evening song you would sing to a child or a tune you would hum absent-mindedly while about mundane daily tasks. But as some might be tasked with playing it (most likely our good friends along the Wasatch Front), I think quarter note equal to 96 beats per minute is a good tempo to get us through the hymn. The fermata in the penultimate measures of the verse and chorus sections highlight to me confusions and alterations this marking can make. I would imagine that common playing practice at this spot would be to hold and then play the chord right after with an eighth note value rather than sixteenth. I’m not advocating that it not be done this way, as I think it give the congregation the best chance at getting that word in, but just highlights how fermatas in our hymnal can often be troublesome. I would probably register this with a good principal chorus through Principal 2’, perhaps adding a soft chorus reed at some point and a low-pitched mixture for the final verse. Newer PostAlps vs Rockies, what do you think?